Angioplasty and stenting is usually done through a small puncture, or sometimes a small incision, in your skin, called the access site. 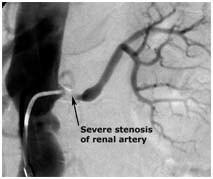 Your vascular surgeon inserts a long, thin tube called a catheter through this access site. 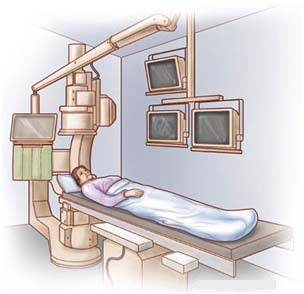 Using X-ray guidance, your physician then guides the catheter through your blood vessels to the blocked area. The tip of the catheter carries the angioplasty balloon or stent. balloon catheter carries a deflated and folded balloon on its tip. 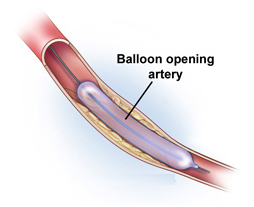 Your vascular surgeon guides the balloon catheter to the narrowed section of your artery. He or she partially inflates the balloon by sending fluid through the balloon catheter. A new type of stent is coated with drugs. These drugs may help prevent scar tissue from forming inside a stent. 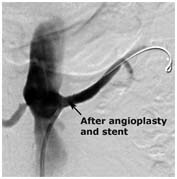 Studies have shown that these new stents may be more likely to prevent restenosis than ordinary, non-coated stents. 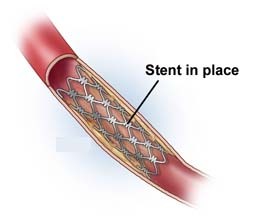 In the United States, physicians currently use drug-coated stents in coronary arteries. Experts are still testing drug-coated stents for use in other arteries. Usually, you will stay in bed for 6 to 24 hours after your angioplasty. During this time, your vascular surgeon and the hospital staff closely monitor you for any complications. If your physician inserted the catheters through an artery in your groin, you may have to hold your leg straight for several hours. Similarly, if your arm was used, then you will need to hold it still to minimize the risk of bleeding.